A sign of the zodiac is encircled by six linked ovals, each containing an inscription. The figure represents Jupiter in Pisces or Mercury in Virgo. It is shown seated, red with some blue detail to define the belt, arm bands, neckline, face and hair. The surrounding ovals are blue in outline, the inscription is red. Laid threads are couched down over surface satin filling stitches. The significance of the protective figures of the zodiac are discussed by James W. Allan in relation to a brass ewer made in Herat, of late 12th/early 13th century date, now in the Nuhad es-Said collection. The uncalibrated radiocarbon result had a result of 1057 AD +/- 36, but the calibrated date range is 1030 to 1220, and therefore does not necessarily contradict the dating on stylistic grounds. The astrological figure represents Jupiter in Pisces: Jupiter is depicted holding two fish. Astrological symbols appear on other media, particularly metalwork, and court chronicles often mention that astrologers were consulted when important decisions had to be made. 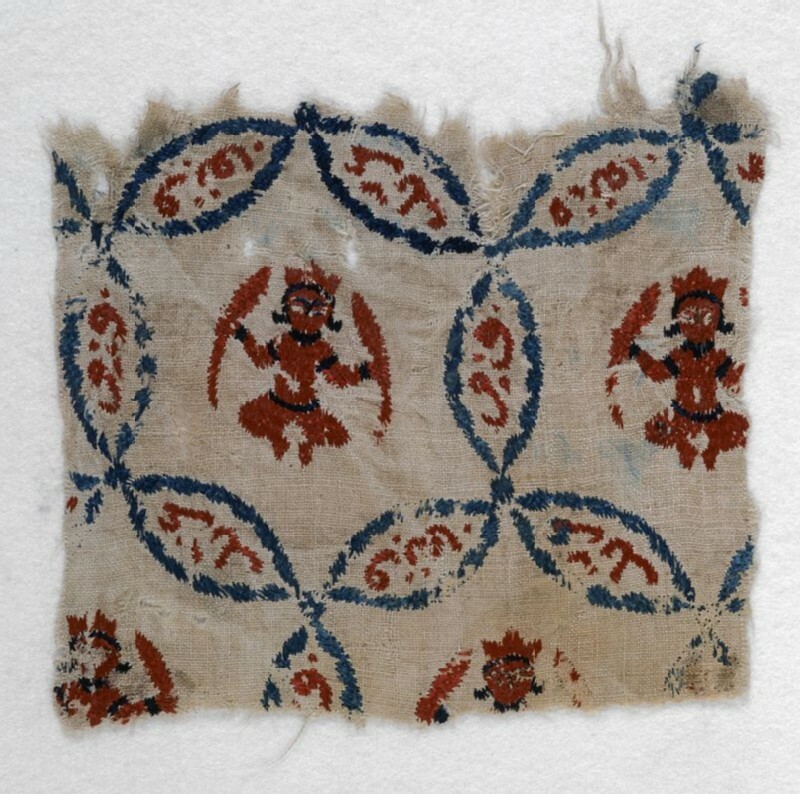 Although it is impossible to know the precise significance of this figure, it is likely that its presence was thought to offer protection against the forces of evil. The embroidery is an example of a specific category in the collection; all pieces were worked in red and blue silk in the same type of couched work technique. It is accomplished in two stages: surface satin stitches are laid across and back to cover the shape, and then another thread is taken across at right angles and overcast with small stitches at regular intervals. The technique is economical because comparatively little thread is placed on the reverse side of the ground fabric. 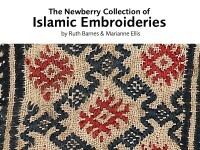 Historically it was often used as a fast way of covering large areas on European and Ottoman embroideries. It is interesting to see how here it has been used successfully on a small scale for a detailed design showing the face, hair, armbands, and belt on the little figures.